The clock is ticking loudly for the current North American Free Trade Agreement (NAFTA) negotiations. Though trade among the U.S., Canada and Mexico has tripled since NAFTA took effect in 1994, U.S. President Donald Trump blames the accord for a loss of U.S. manufacturing jobs and rising trade deficits. Prompted by the Trump administration’s threats to walk away from the trade agreement all together, talks to update NAFTA effectively began in August 2017 with dual objectives: Modernizing an aging agreement for new economies and rewriting it to appease Trump. For Trump, NAFTA is mostly about cars. Mexico has emerged as an auto-making powerhouse within NAFTA, sending on average of $4.3 billion in parts and $2.6 billion of finished vehicles each month to the U.S. over the last five years. Under current NAFTA rules, at least 62.5 percent of a car needs to be sourced from the three countries in order for it to be traded tariff-free. U.S. negotiators are said to want to raise that to 75 percent, down from their initial proposal of 85 percent. The U.S. also wants to expand the “tracing list” of car parts whose origin is actually tracked. 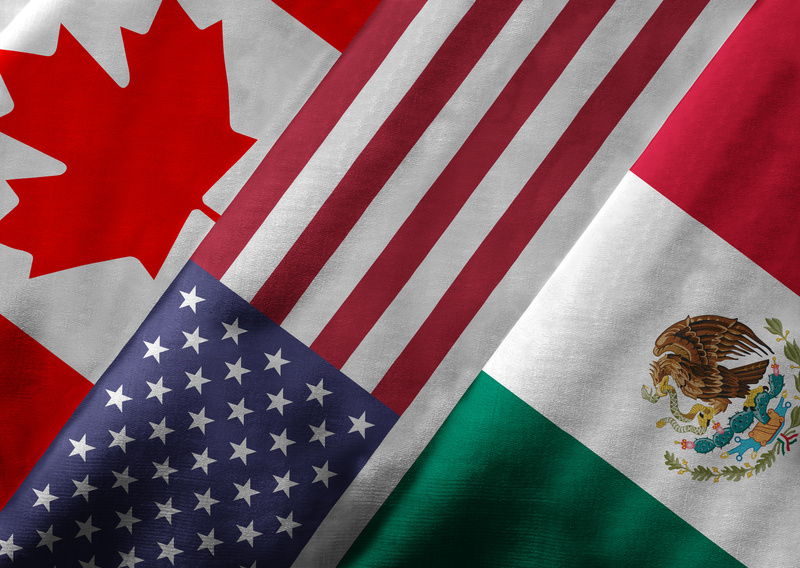 Canada and Mexico have warned that the U.S. proposals are too much, too fast, and that companies would simply abandon using NAFTA, and pay U.S. tariffs, which are relatively low, rather than disrupt their supply chains. Not surprisingly, Trump sees imports of vehicles as a major challenge to the US’s growing trade deficit: Roughly 12 million cars and trucks were produced in the United States last year, while the country imported 8.3 million vehicles worth $ 192 billion. This included 2.4 million from Mexico, 1.8 million from Canada, 1.7 million from Japan, 930,000 from South Korea and 500,000 from Germany, according to U.S. government statistics. At the same time, the U.S. exported nearly 2 million vehicles worldwide worth $ 57 billion. At the same time, the U.S. wants to stem the loss of manufacturing jobs to Mexico, contending low wages is costing American jobs. Canada also broadly shares this goal. While the U.S. has significantly softened its earlier demands, it still wants 40 per cent of every car built by workers making $16 per hour; 75 per cent of all parts to be North American; and 70 per cent of steel to be sourced in that country. Furthermore America wants the re-negotiated deal to credit companies for research and development spending. Critics of America’s demands say it could backfire: If auto-makers decided they didn't want to deal with all the red tape, they could just ignore NAFTA and simply pay the 2.5 per cent U.S. tariff on cars. Critics warn that this won't create jobs — just more expensive cars, and less economic activity. Even though all three signatories will be impacted by a new NAFTA, it’s Mexico that stands to lose the most. With Trump blaming low-cost Mexican production for the outsourcing of U.S. manufacturing jobs south of the border, U.S. proposals have centered on increasing Mexican salaries and providing incentives for auto manufacturers to either move production back to America or at least cap investment in new manufacturing facilities. Seeking to appease the NAFTA trade partners while still retaining at least some of its hard fought auto manufacturing investment, Mexico has presented a number of proposals that negotiators hoped would satisfy the other parties. This included a proposal that 70 percent of parts be sourced from the three countries to avoid a tariff — the U.S. has asked for 75 per cent. But while that’s up from the current 62.5 percent, it’s unclear if it’s enough to strike a deal. Importantly observers point out that Mexico's proposal has not acknowledged the firm wage standard the U.S. has demanded, ignored demands on using North American steel and would allow companies a 10-year adjustment period — more than double the proposed U.S. phase-in time. While the issue of auto wages remains contentious, Autonews reports that two people involved in the negotiations have said that the Mexican government has left room for using some level of higher-wage production as a way to meet the new NAFTA content criteria. Still the Mexican proposal included no wage targets, underscoring the competing interests in the complicated talks. On the back of the negative sentiment emanating from the talks Mexico's peso sank to its weakest level in more than a year in mid-May, with Mexico's Economy Minister Ildefonso Guajardo saying the currency was being hurt by uncertainty over NAFTA talks and Mexico's upcoming election. Mexico will hold presidential elections on July 1 and Andres Manuel Lopez Obrador, the leftist candidate who has led in polls, has said the re-negotiation shouldn't be rushed through and should be left to the winner of the election. While the Canadian government has voiced concerns over the specifics of the proposed new rules and offered broad suggestions it is less of a litigant than the other two countries, who have clashed with different visions of the future of the sector. Although Canada, in principle, supports America’s demands on wages, the government is concerned that a new NAFTA should not unsettle the Auto industry in other areas. The auto rules themselves must be adjusted with care, as seemingly small changes could have far-reaching effects. 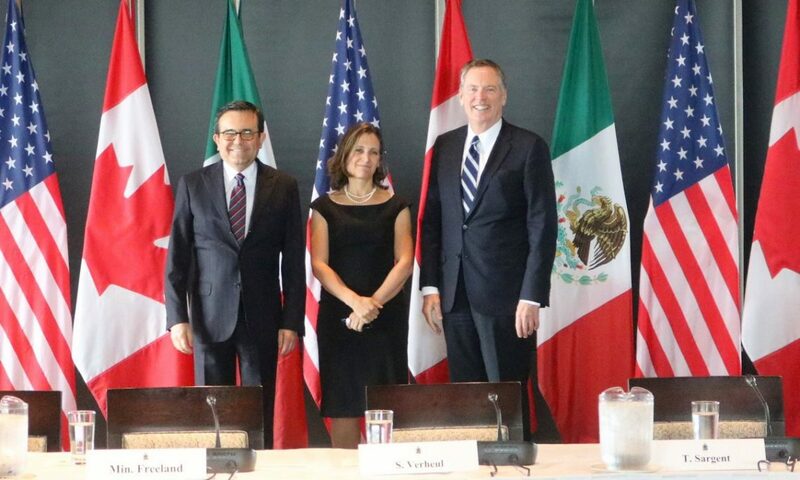 Addressing the press on May 9th Foreign Affairs Minister, Chrystia Freeland cautioned against a significant disruption of the rules governing the huge, highly integrated automotive industry in North America. Warning that making a mistake would burden companies with far too much red tape, “something that's too cumbersome that makes North America less competitive, compared to the rest of the world." She continued to say that Canada wants rules that do not force car and car-parts companies, to spend too much time on administration and on box-checking, when they should be spending most of their time inventing, and building great cars and trucks. An industry-funded report for the Center for Automotive Research recently estimated that the proposed U.S. changes would amount to a multibillion-dollar tax on consumers, as car companies would face a choice between abiding by tougher new standards, or simply paying the 2.5 per cent vehicle tariff and possibly passing the cost on to consumers. The study calculates that somewhere between 25 to 87 percent of vehicles currently sold in the U.S. would fail to meet the new rules, and would wind up simply paying a tariff. In a move widely seen as attempting to pressure Canada and Mexico to make NAFTA concessions, the Trump administration on May 23rd launched an investigation into whether tariffs are needed on the imports of automobiles into the United States. And in a worst case-scenario, if Trump does decide to pull out of NAFTA, he would first have to give six months’ notice to the other signatories, Mexico and Canada. But it’s unclear whether he could do this on his own: NAFTA was implemented through congressional legislation in 1993, so U.S. lawmakers could potentially vote to block its repeal. And exporters, importers and trade organizations might file suit. If Trump prevailed, trade between the North American neighbors would likely revert to World Trade Organization rules, which came about in 1995, around the same time as NAFTA. Under these, tariffs on U.S. exports to Mexico would average 7 percent; imports from Mexico would average 3.5 percent.